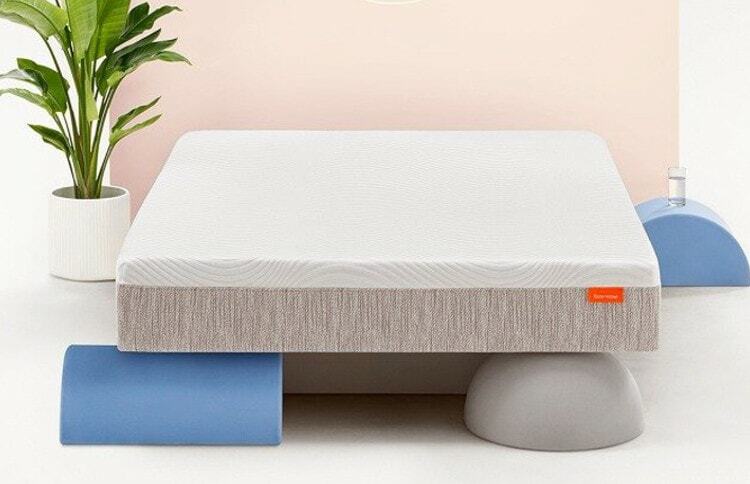 Tomorrow Sleep introduced their array of sleep products, including their hybrid mattress, in 2017. In this Tomorrow Sleep mattress review, we will showcase their latest addition, their memory foam bed. Prior, this was the one thing missing from their product selection. This much-desired sleeping surface is now making its own name for itself and is also gaining popularity with its very affordable price. Make sure to take advantage of our additional $125 coupon too! This mattress has three layers of foam to create a universal medium-firm feel. By pairing two layers of memory foam with a dense and solid base foam for ideal 10 inches of comfort and support. This bed is perfect for so many sleepers. Since it has an ideal feel and comes in at a budget friendly price point too. Regardless of shape, size or sleeping preference this bed is a great option. The top layer is a cool open cell memory foam. Designed to regulate body temperature as well as conform to your body. Another layer of pressure relieving memory foam is under this top layer. Adding to the comfort and contour while dissipating heat too. Both comfort layers are open-celled foam to draw heat out. The layers paired with the base foam are durable enough to comfortably hold up to 1000 pounds every night. Making the materials and construction top notch and durable for it’s entire lifetime. Tomorrow Sleep is partnered with Serta Simmons to pass on the best sleep products to you. This allows for access to the best mattress technology and trends to elevate sleeping. This American made bed is now offering a 365-night trial. This is a full year to make sure this mattress is right for you. This dense mattress will last many years and is warrantied for 10. It also is shipped for free and they offer free returns as well. Not to mention the full line of sleep products and accessories that perfectly pair with this bed. Make sure you check out the full line of sleep solutions to track your rest or add a pair of comfy sheets. Even pillows and comforters are in this lineup. And don’t forget the value of this mattress is very impressive, especially when paired with our exclusive $100 coupon. Just use code: OSG100 at TomorrowSleep.com. Below you’ll find the best Tomorrow Sleep Mattress review of their memory foam bed available. We will go through all the details you’ll need to know. Including the breakdown of materials, insight into comfort and several other categories. The Tomorrow memory foam mattress has two shipping options. One is a free delivery option that sends the mattress compressed and roll packed into a box. The mattress is sent through a delivery service like Fed-Ex or UPS and arrives in 5 days. The other option is a white glove delivery service. This is an additional fee that includes setting the mattress up for you as well as removing any debris. Either delivery method will get you the same well made mattress. And any fumes that do come out will be minimal and non-hazardous. Any smells that you may notice are from the plastic and any “new foam” smells. Tomorrow Sleep has the highest safety and health standards in place to ensure their mattresses have no off-gassing. 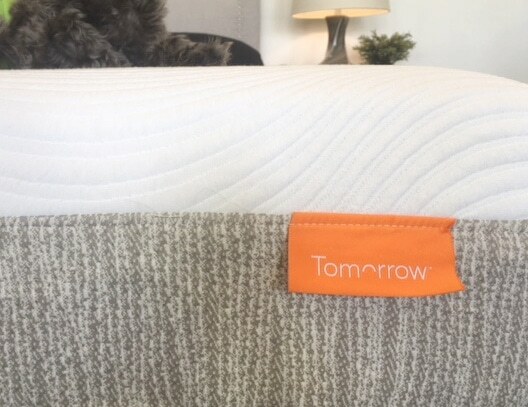 The Tomorrow Sleep memory foam mattress comes in one universal feel. It will be a medium-firm feel and should offer the best comfort and firmness for the majority of sleepers. The combination of comfort memory foams will be dense and supportive. As well as pressure relieving and contouring. This mattress should work for the majority of sleeping positions but is most ideal for back and stomach sleepers. The density of the foams creates a solid surface that contours to your back just enough. If you are a side sleeper that likes more support than this would also be a good option. However, if you are a side sleeper that likes a little more softness for your shoulder and hip to sink in this may be a bit too firm. The Tomorrow memory foam bed would also work great for heavier sleepers too. This mattress does use denser foams that can comfortably hold up to a maximum of 1,000 pounds. Making it durable for the long haul for anyone, but a great option for anyone who weighs a bit more too. Making a comfortable mattress for all shapes and sizes. A pretty tough feat, especially for this price! 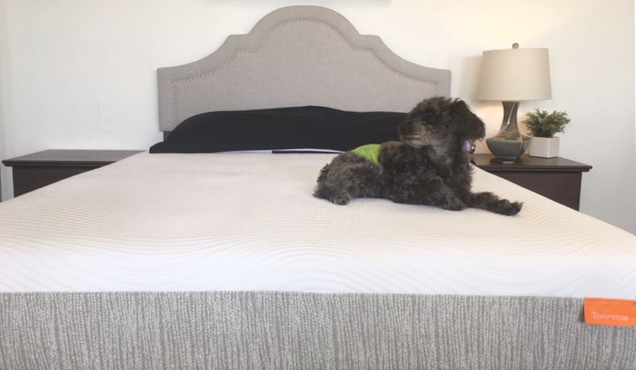 During our Tomorrow Sleep mattress review, we were quite impressed with the feel and comfort of this memory foam mattress. The medium firm feel was just soft enough to be comfortable for side sleeping yet plenty supportive for stomach sleeping too. Not to mention the pressure relief and lumbar support while sleeping on your back was ideal. It is actually hard to believe that the price of this mattress is so reasonable and the quality and comfort bypass several other more expensive competitors. The memory foam is a true memory foam feel but wasn’t so low moving that you felt stuck. It was great for changing positions easily and ideal for all sleeping positions. This Tomorrow Sleep mattress is an all foam mattress that will do a great job of eliminating excess vibrations. Whether you are tossing and turning, getting in and out of bed or are just a light sleeper you won’t notice much motion transfer from this mattress. 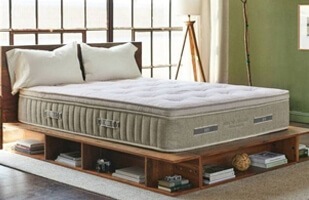 The two layers of memory foam absorb most movement and the dense base foam deaden any beyond that. Anyone looking for a mattress that has good motion isolation should consider this Tomorrow Sleep mattress. Sometimes sleeping cool on a memory foam mattress is a bit more difficult than mattresses made from other less heat retaining materials. Most memory foam beds try to counter the typical heat retention by adding various technology and properties to dissipate excess heat. The Tomorrow memory foam mattress is not much different. 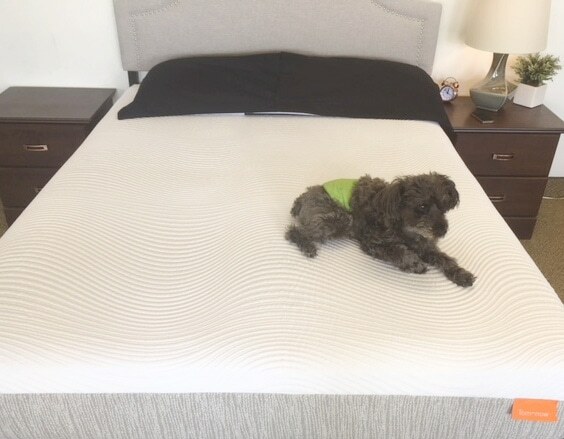 The top layer of memory foam uses open cell technology to help regulate body temperature. The second layer of memory foam uses a gel infusion to help minimize heat as well. This combined with a dense base foam that creates a more solid surface that you are less likely to sink in does help keep heat retention to a minimum. However, if you are a very warm sleeper a memory foam mattress, in general, is probably not going to be your best bet. The density of the foams on every layer of the Tomorrow memory foam mattress make for a solid sleeping surface. This also contributes to the feel and stability of the perimeter of the bed too. You are easily able to fully utilize the entire mattress for sleeping and will feel little to no difference sleeping on the edge from the middle. The foams are even dense enough to make for minimal sitting comfortable and sturdy. The edge is a good testament of the quality of materials and construction in this all foam bed. In our Tomorrow sleep mattress review, we found the edge support to do a fine job with this mattress. It was very consistent feeling from edge to edge and allowed a fully usable sleeping surface. The edge was even okay for minimal sitting use and was a great testament to the quality of the materials and density of the foam. This Tomorrow Sleep mattress is priced very well for a true memory foam bed. A queen size is $795 and that isn’t including our exclusive $100 coupon. Just use the code: OSG100 at tomorrowsleep.com to bring it down to ONLY $695! This mattress also has free shipping, a 365-night trial period and a 10-year warranty. Making a mattress of this quality at this price a great value. What you get for the price of this mattress makes it an amazing value. Especially when you throw in the $100 extra savings. The feel and support of this bed are ideal for almost all sleepers and the quality of materials makes it durable and long-lasting. The very affordable price tag is just another added bonus when it comes to this mattress. The Tomorrow Sleep memory foam mattress consists of three layers to make this 10″ mattress. The top layer is 1″ of 2.8lb Cooling Open Cell Memory Foam. Providing a true pressure relieving memory foam feel as well as helping to regulate body temperature with its open cell design. Under this is a slightly softer layer of memory foam. It is 2″ of 2.5lb Pressure Relieving Gel Swirl Memory Foam. It is not only for better heat dissipation but also to cradle and conforms to your body. Both working together to evenly distribute weight and provide an ideal level of comfort. This sits on 7″ of 2lb High-Density Base Foam. This layer is the foundation and the where the bulk of the support and durability are. The long term support and longevity are also in the base. Giving a solid and durable core for the comfort layers. All of this is wrapped in a perfectly soft and breathable knit cover. Made to be durable yet cool to the touch and feel great. 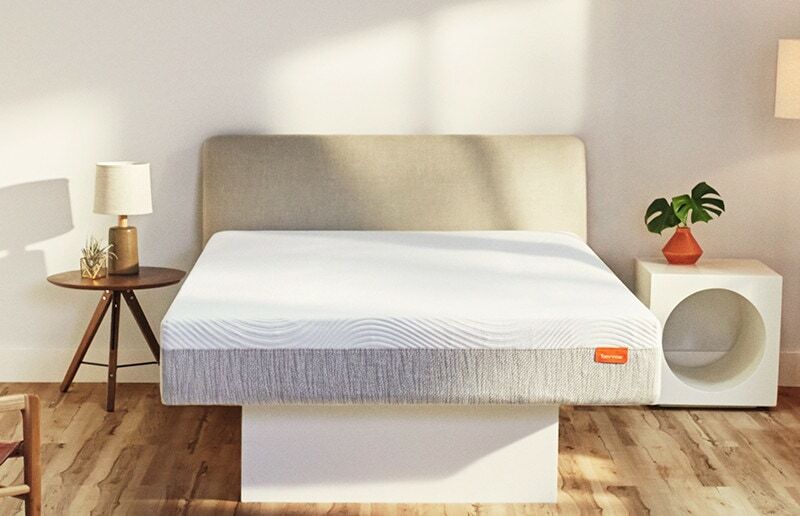 The Tomorrow Sleep mattress comes with a 365 night trial period This full year of time is way more than plenty of time to decide if this mattress is right for you. Most of the time your body will only need a few weeks to months to adjust to a new bed. However, this substantial trial period is great for anyone who may be more fickle to the idea of buying a bed online. The trial period also includes free returns, making the process as easy as can be. The Tomorrow Sleep mattresses come with a 10-year warranty. Even though these beds have been tested to withstand full use up to 20 years the recommendation for having a mattress is set at 10 for hygienic reasons. This 10 warranty is the most common especially for this type of mattress. It is more than sufficient and Tomorrow will easily work with you to resolve any issues. 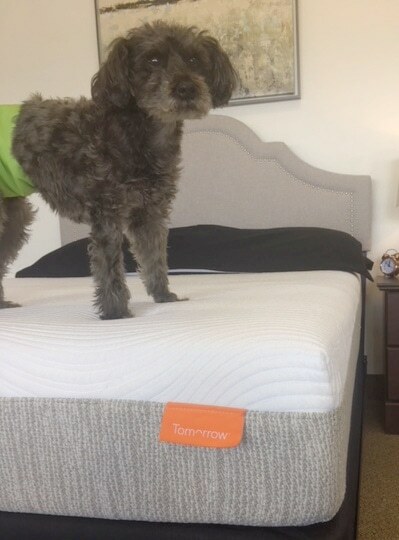 Thank you for checking out our Tomorrow Sleep Memory Foam mattress review. 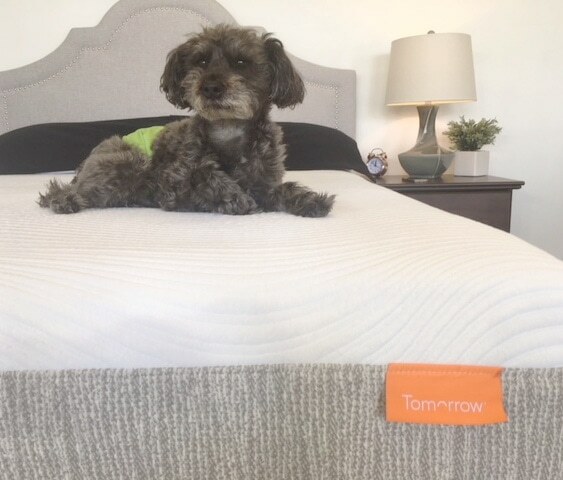 If you are looking for more specifics for the Tomorrow Sleep trial period & warranty find out more at tomorrowsleep.com or for a helpful tool check out Our Mattress Warranty & Trial Period Guide. We know that our word is more than plenty to help you decide on your new mattress. However, with all the rave Tomorrow Sleep mattress reviews how can we not share some of them too! “This bed is very firm and comfortable. I laid down on the mattress and it helped my back as I sank a little bit into it. The memory foam makes it very easy to fall asleep in.” – Malik B. “This mattress is so unbelievably comfortable! It’s like sleeping on a cloud! As soon as you lay down, it hugs your body to the perfect shape without being too soft or too firm. I never want to get up!” – Elizabeth M.
“Surprised how comfortable the mattress felt in a variety of sleeping positions. I’m a back-sleeper, but after rolling around and trying out my side, I might switch. I’ve never considered purchasing memory foam-style beds because of the price point, but I had to reconsider after this one. 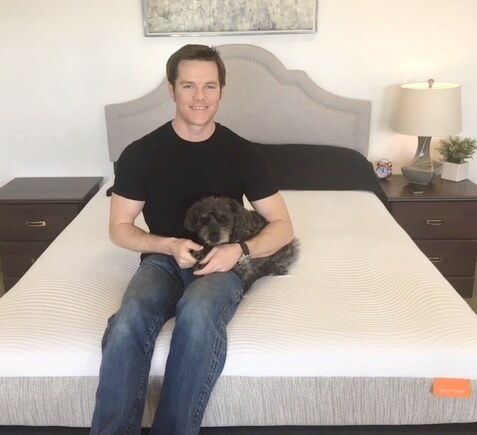 This is cool!” – Walter K.
It doesn’t stop at the memory foam Tomorrow Sleep mattress review! Make sure to check out the other Tomorrow Sleep mattress, the Hybrid; HERE! Also, this mattress is featured as our #1 Best Mattress on a Budget. See how it compares to others around the same price point. Also when compared to other brands the Tomorrow Sleep mattress really stands out. Check out some oft he comparison reviews it is featured in. Including the Tomorrow Sleep vs Casper Essential, Tomorrow Sleep vs Bear, Tomorrow Sleep vs Puffy and Tomorrow Sleep vs Brooklyn Bowery. Overall the Tomorrow Sleep memory foam mattress performed very well in our review for a universal one feel bed in a box. It is made of quality foams and creates an ideal feel as well as good support. The price, especially with our coupon, is very affordable and makes for a great addition to any room. If you want a true memory foam mattress that is an ideal medium firm feel. You want a high quality mattress at a very affordable price that offers plenty of support and durablity. You want a memory foam bed that has good motion isolation, breathable foams and a solid edge. You want to buy from a company that has years of experience and mattress technology behind it. Still looking for some more information? Visit Tomorrow at tomorrowsleep.com. Also, have questions for us? Please contact us and we would be happy to help you!